Sampriti Bhattacharyya with one of her innovative underwater drone prototypes. 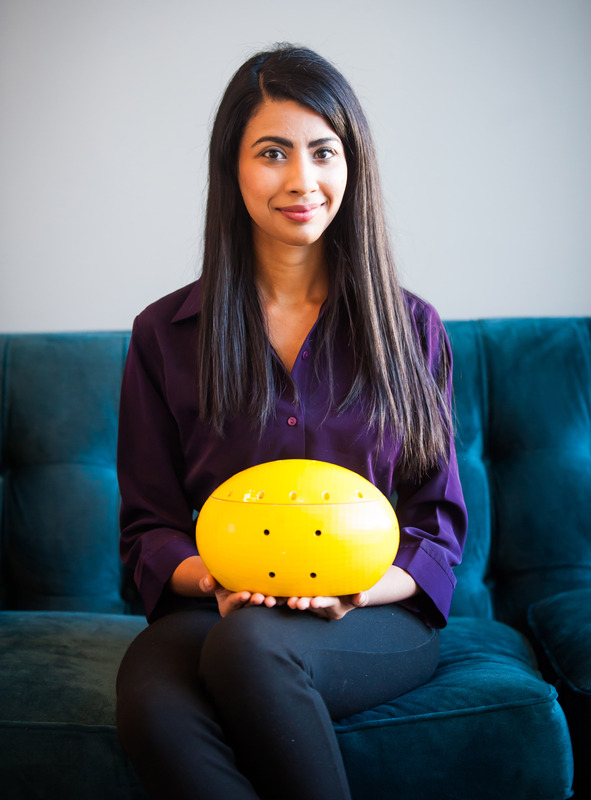 [photo: Hydroswarm]At just 28 years old, alumna and current MIT PhD student Sampriti Bhattacharyya launched startup Hydroswarm in the Boston area. Hydroswarm is commercializing the football-sized autonomous underwater drones Bhattacharyya helped develop. These egg-shaped robots are capable of working alone or in tandem to map the ocean floor, inspect underwater nuclear reactors, search for lost planes and complete virtually any other underwater surveillance task. The startup won $50,000 in last year’s MassChallenge and has captured worldwide attention with its innovative, relatively inexpensive robot design. Soon thereafter, she was named to Forbes 30 under 30 Class of 2016 for Manufacturing/Industry, an honor that recognizes bright, young change agents. And in her spare time, she co-founded an international non-profit. Yet according to societal expectations in her native India, not attending a top engineering school should have spelled the end of Bhattacharyya’s career before it even began, she said. Originally she wanted to be an astrophysicist, but Bhattacharyya followed her mom’s advice and enrolled in engineering instead because it offered better career prospects. Like most small Indian colleges, her alma mater lacked resources that are standard in U.S. universities, she explained, such as well-equipped laboratories and hands-on learning opportunities. Knowing she wouldn’t enjoy IT work, Bhattacharyya began applying for other opportunities. She was offered an internship at Fermilab, America's premier particle physics laboratory. She calls it a turning point. Her passion for engineering fully ignited, Bhattacharyya decided to pursue a master’s in aeronautical and aerospace engineering at The Ohio State University. Her master’s research with Mechanical and Aerospace Engineering Professor Rama Yedavalli involved using a particle accelerator beam to produce energy from nuclear waste. That process also made the waste less radioactive. Bhattacharyya’s original plan for her doctoral research at MIT was to build the model system she had designed at Ohio State, but she soon realized the regulatory issues involved would be beyond the scope of her project. So instead she started working with Ford Professor of Engineering Harry Asada on a robot designed to look for cracks in a nuclear reactor’s water tanks. One day, while reading about contraband smuggling, Bhattacharyya realized that their robots could also search ships for contraband hidden in cavities or fake chambers. Then Malaysia Airlines flight 370 went missing. She suspected those little robots might be able to do a whole lot more, like locate missing wreckage. Unlike existing underwater vehicles that are large, expensive and tend to be very mission specific, Hydroswarm’s small drones are relatively cheap. Able to navigate autonomously through water as well as along underwater surfaces, the battery-powered robots can be fitted with various sensors, depending on the desired task. The company’s innovative robot concept has been covered internationally in outlets such as The Guardian, New Scientist and Smithsonian. One of the team’s breakthrough advancements is how quickly the robots can communicate with each other, enabling them to be used alone or in groups to cover more territory. Although she’s excited to earn her PhD soon and work full time as the startup’s CEO and chief scientist, Bhattacharyya hasn’t forgotten the challenges she faced as an undergraduate student. So she co-founded and helps run non-profit Lab-X Foundation together with other young engineers—including fellow Buckeye engineers Ketan Dande (EE MS ’12) and Varun Joshi (EE MS ’12)—to provide hands-on opportunities and global exposure to students in developing countries. Lab-X Foundation aims to create a culture of hands-on learning through programs such as internship opportunities, research demonstrations and workshops, student poster and exhibit sessions, and presentations from diverse speakers. For future engineers who want to break barriers of their own, Bhattacharyya offers some simple advice: believe in yourself, don’t be afraid to try new things and do something you truly enjoy.